Worthington offers the peaceful charm of small-town living with big-city caliber amenities. As one of the Midwest’s first planned communities, Worthington has preserved its historic roots and established itself as a dynamic hub for commercial businesses, residents and visitors. The city of Worthington, Ohio is the epitome of small town America. Established in 1803 by settlers from New England, this picturesque suburb is filled with the same charm and appeal it fostered over two centuries ago with historic buildings, tree-lined streets, friendly neighborhoods and a quaint downtown. 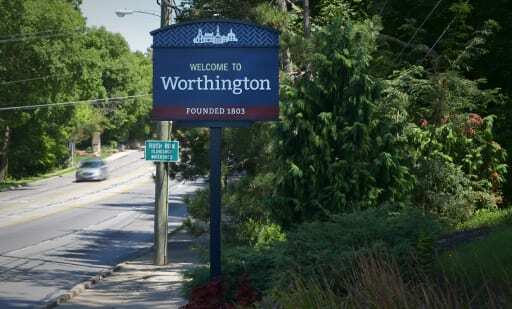 While Worthington is the quintessential place to live and work, a citywide steering committee needed to make their outdated navigation experience better. On a broader scale, they wanted to strengthen their brand identity so even more people could connect with this picture-perfect. Collaborate with the steering committee for multi-day discovery sessions to uncover goals, personality, brand perceptions and positioning. They voiced concerns about making main attractions and parking more accessible. Officials also wanted to create more welcoming entry points and bolster their reputation as a bike and walking-friendly city. Worthington took a phased approach to rolling out the new wayfinding program, so our strategy prioritized the downtown historic district, called “Old Worthington,” along with pedestrian and vehicular signs that direct visitors to popular destinations, including the village green and Farmer’s Market, as well as nearby parking. Create two wayfinding design concepts – New England Colonial and Contemporary – for officials to choose from. Despite their desire for a modern look, they ultimately selected the traditional, New England option because it authentically represented Worthington’s unique brand character. Leverage the design concept to build a customized wayfinding program that intuitively guides visitors to popular destinations while tying in the community’s key attributes. Many of the gateway and directional signs pull in a distinct herringbone pattern – an ode to Worthington’s classic red brick roads. Redevelop the city’s logo and logotype to display across current and future wayfinding signs and marketing materials. Deliver brand guidelines and sign standards to empower the city to implement future phases of the program, including the Wilson Bridge Road Corridor. As Columbus and other cities continue to grow and expand around Worthington, the new wayfinding strategy enables them to sustain their close-knit feel. The new signs also make movement easier and more pleasant regardless of whether you’re walking, biking or driving throughout the city. Since implementing Phase 1, Worthington plans to extend the wayfinding program to the Wilson Bridge Road Corridor, one of the city’s key economic centers, and other important areas around town. The distinct aesthetic and sign standards will make it easy for them to apply the program consistently everywhere, and most importantly, for more people to experience and explore this storybook community.